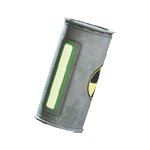 Nuclear Material in Fallout 76 is a Material used for Crafting. It is broken down from source Junk and then combined with other Materials to produce Mods, which are then applied to Equipment to improve and customize. This Material will automatically be salvaged from any of the below items you possess, when Crafting, if you don't already have enough in your storage or on your person.